Synopsis: David Smith is giving his life for his art—literally. Thanks to a deal with Death, the young sculptor gets his childhood wish: to sculpt anything he can imagine with his bare hands. But now that he only has 200 days to live, deciding what to create is harder than he thought, and discovering the love of his life at the 11th hour isn’t making it any easier! Review: I do not read a lot of comics, it is true, but that’s why it’s always interesting to get into a new story such as this one. 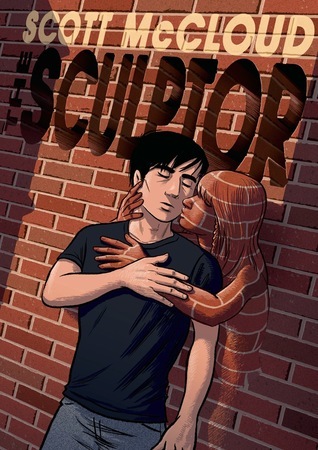 Scott McCloud seems to have realized many novels but I confess that I did not know anything about his work. I was therefore curious to know more about it. First of all, I was surprised enough when I got the book because it was really huge. I’m used to thin comics and I did not know that we could find such novels. It is not at all problematic and it is even more intriguing because it allows us to discover more about the life of our hero and to admire many more beautiful illustrations all along the story. But back a little more about the story. David Smith is a failed artist. He has no family, he has no girlfriend, he is broke and unable to sell his structures. But well for that he first must produce a structure… But when one day, in the process of self-pity, his dead uncle comes to him, explaining him the possibilities of his future life: Finding a wife, starting a family but never making a breakthrough in art. Yet David does not care about all this, his sculptures are all his life and he wants to make a name with them. A covenant with death will be able to realize his dream. Yes, David will only have 200 days before dying but during that time he will have the ability to shape any material to create what he desires. An interesting gift is not it? But his works needs to be worth some money and marketable and it’s finally quite complicated. David will have to think about what he wants to do without externalize his past. But a surprise is waiting on this quest, the appearance of the love of his life, a girl who liked him without loving him and he is determined to make her succumb. But is it a good idea to create something with a fragile girl when he knows that his days are countered? I admit that the plot was really interesting and I was curious to see where this would lead our hero. Some illustrations have no words but they allow us to learn more about this whole environment and about our out of the ordinary heroes. By cons I confess that I’m not sure I really understood the end of the story but I’m glad I discovered the whole story. This entry was posted in Comics, Scott McCloud. Bookmark the permalink. LOL it’s the part I’m a little lost about. You pick up such an interesting variety of books. It’s always so fun to see what you’re up to now. I’ve not read many comics so I have no real idea on them. Glad you enjoyed it even if the end was a little up in the air for ya. LOL sometimes it’s interesting to change and discover new things. I don’t read that many either, and most ones I do are from TV Shows, but this one sounds like so much fun (and that cover, so awesome!) 🙂 Glad you enjoyed it, even if it’s not usually your thing. I don’t read a lot of comics either but this does sound like it was a good one. I do like looking at the artwork! yes me too, it’s always beautiful! I don’t read many comics or graphic novels either, but I’m always fascinated when I do pick one up. I fully admit that I sometimes get easily lost (as you did in the end of this) and lose track of what’s happening in the illustrations, but overall I really enjoy them! lol it’s a big problem that’s for sure. I am certainly curious! I don’t like the cover, but this sounds super interesting. The illustration on the cover is very eye catching, and if the rest are like that, I am sure it is worth picking up. I am curious about the ending now. Thanks for sharing this interesting title. I hope you’ll like it if you try it lady! That’s great you enjoyed this one, since you don’t read a lot of comics/graphic novels. I have this to read soon! Seems like a real twisty plot. I’m so glad that it also works! I’ve been curious about this one and now I want to read it. Brilly review. Well now you have me curious and I love that the plot had twists and kept you sharp. Oh sorry… that’s sad. They sended it to me. I didn’t ask for it but it’s interesting to try new things. I could never get into comic books, even when they have a good story. I hadn’t heard of this book before, but it’s been a while since I’ve read a comic. This sounds like a book that was made to come with pictures though. (If that makes sense) I don’t like that we know he’s probably going to die at the end. Kind of makes a sequel impossible. I’m curious since you couldn’t tell what happened.